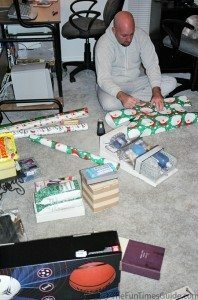 As we prepare to wrap our Christmas gifts this year, I am reminded of the many “interesting” experiences that Jim and I have had in previous years while wrapping gifts. Not the least of which were those times that our dogs managed to get involved in the process! So, whether you’re usually in a hurry and simply don’t take the time to do it right, or you just never learned “the proper way” to wrap gifts, following are some of the best-of-the-best tips for wrapping presents. …Christmas presents… Birthday presents… Graduation presents… Wedding presents… whatever. #1. Start by finding an appropriately sized box for each gift item that does not come in its own smooth-sided box. Can’t find one?… just take a peek inside your pantry and consider using a Pop-Tarts box, a popcorn box, etc. TIP: When placing an item inside a box, first line the box with some colorful tissue paper, then add the item, and tape the box shut so it’s easier to wrap. #2. Clear a large surface area just for wrapping gifts — either a table, counter, or the floor if necessary. 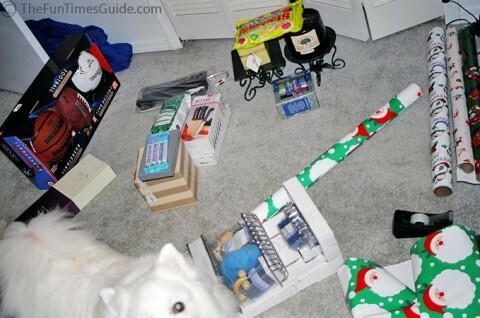 TIP: If using the floor, make sure you’ve vacuumed first, so the recipients of your gifts don’t find pet fur, lint and such adhered to the tape used to wrap their gift. #3. Gather your supplies: a sharp pair of scissors, a fresh roll of tape, and a few different rolls of wrapping paper. TIP: A tape dispenser is preferable to a disposable roll of tape because it rests firmly on its surface and allows you to hold the wrapping paper in place with one hand, while pulling exactly the right amount of tape you need with the other. #4. To determine how much paper you’ll need for each gift, use this guide: Take a piece of string and measure the circumference of the item. Then, lay that string out on your wrapping paper, and cut that length — PLUS a few extra inches for tucking the ends in. #5. After you’ve cut the paper to fit the gift, then wrapped the paper around the item, and put the first piece of tape into place… it’s time to examine how much extra paper you’ve got on the ends. If you’re left with a lot of excess paper on the ends, then you need to trim paper from the sides so you have just enough paper on the top and bottom for each to go a little more than halfway up that side. Any more than that, and your ends will look messy — like they’ve been crammed with bunched up paper! To finish wrapping the ends, simply tuck them in on the right and left sides and make crisp creases. Then, fold the bottom flap up and the top flap down — like an envelope. Add tape to seal in place, then do the same to the other end. #6. Personalize the gift with a ribbon, a bow, or — at the very least — a nifty nametag. There are number of creative ways to jazz up the “look” of your basic wrapped gift. #7. When in doubt… or if the gift-wrapping process seems just too time-consuming for you, then opt for a gift bag! #8. Get organized THIS year, so the process will go even smoother NEXT year! Check out these unique wrapping paper holders and holiday organizers for all your bows, ribbons and supplies! 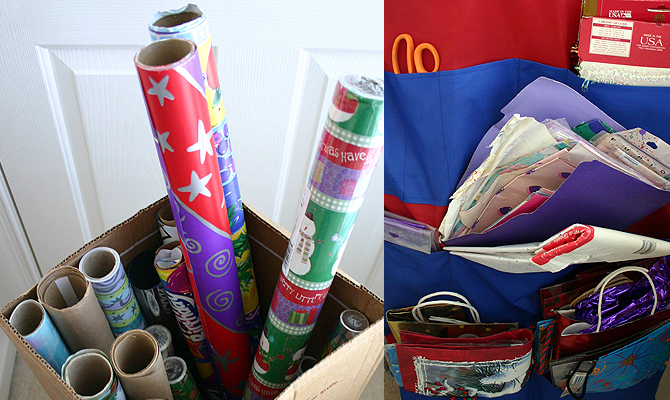 TIP: Buy wrapping paper AFTER Christmas each year… it goes on sale for a dime a dozen! And whenever you have a choice, always opt for thicker paper over thinner paper. Thinner is cheaper, but also much more likely to tear during the wrapping process at the corners. Thin paper is very hard to work with.